Stock photo of the Maman sculpture outside the National Gallery of Canada with the Notre Dame Cathedral Basilica in the background, city of Ottawa. 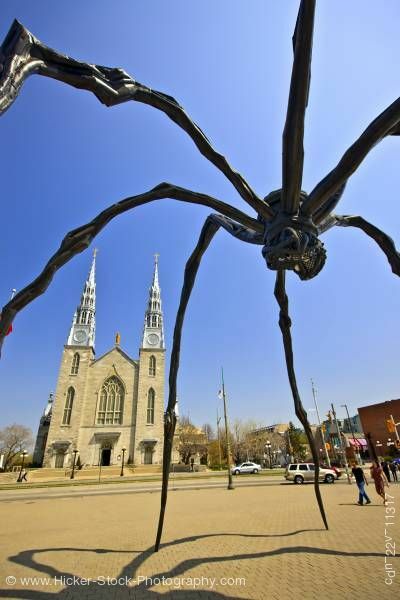 Maman Spider sculpture in Ottawa, Ontario, Canada. Sculpture named Maman with the Notre Dame Cathedral Basilica in the background in the city of Ottawa, Ontario, Canada. The Maman sculpture was created by artist Louise Bourgeois in 1999. The cathedral basilica is designed in the Neo-classical style of architecture and was finished in 1846.